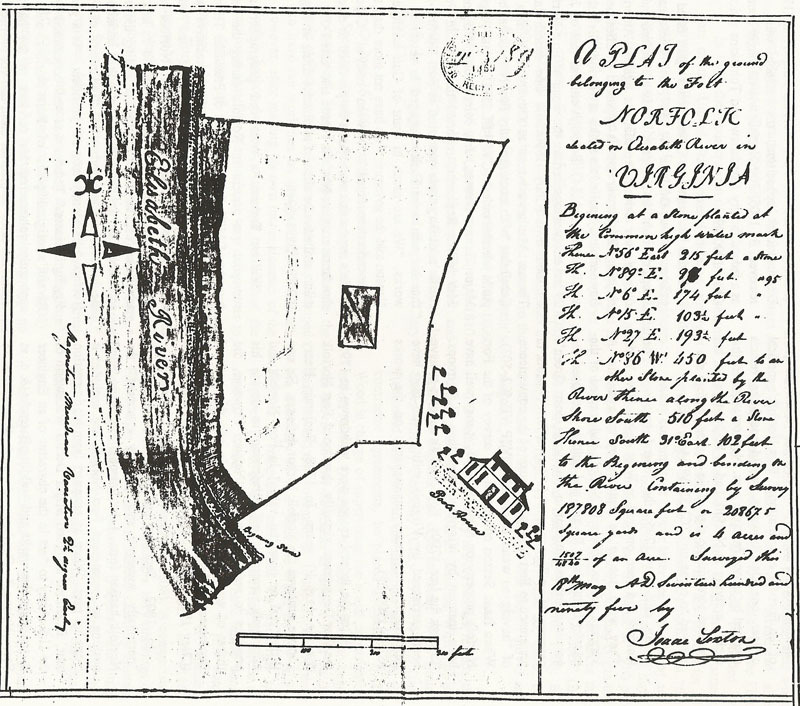 In 1802, Secretary of War Henry Dearborn "personally surveyed and critically examined" the Norfolk harbor forts. Like Latrobe, Dearborn found nothing to recommend Fort Norfolk and excluded it from his plan. When he returned from his inspection tour, Dearborn assigned Major Decius Wadsworth of the U.S. Army to "act in the character of an Engineer in repairing the works and building Barracks & c. at Fort Nelson." Dearborn directed Wadsworth to dismantle "the officers building at Fort Norfolk" and remove it to Fort Nelson to be "converted into an Hospital in the rear of the public lands" (Buell Collection [BC] #16, Dearborn to Wadsworth, August 16, 1802). It seems probable that the "officers building" was the structure that Isaac Sexton depicted standing behind the Fort Norfolk rampart in 1795. Despite local opposition, the cannon were also removed. By 1806, Fort Norfolk was no longer counted as a federal facility (Bradshaw and Tompkins n.d.:14; Clary 1990:29).